In their day jobs, Diana is a writer and editor, and Jennifer is a registered nurse. 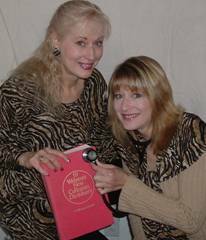 The Savage Sisters, Diana Savage and Jennifer Savage Tjeerdsma, are real-life siblings. Whether at home, work, or play, they tackle every challenge with their own special brand of creative problem-solving. Jennifer is a registered nurse. Diana, a writer/editor, is the author of 52 Heart Lifters for Difficult Times and coauthor of Pseudonym and Finding Success with Your Dream Writing Projects. On this blog, the Savage Sisters share their unique ideas with the rest of world. © 2014 The Savage Sisters. All rights reserved. Now I know what to do with broken stuff…bring it to you! What is the story behind the coordinated outfits? Great blog, love the pictures, keep on keeping on! I love your fire starter idea. This would be fun for kids to do, with supervision of course, as gifts to give for Christmas. Your site is a great way to encourage self-sufficiency and frugality! Cool website you and your sister have! Hi Diana – I’m just now finding your blog site and I’m going to add you to my blog roll! Looking forward to reading this!